Simple, powerful, fun. Graphic design software for creative people. 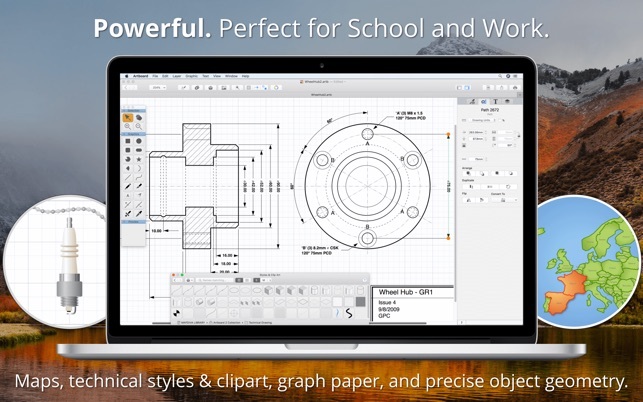 Artboard gives you professional quality drawing tools with a fresh macOS feel. Create crisp vector graphics, sharp logos, pixel-perfect icons and layered illustrations. "This is what vector drawing should be. It's simple to the point of not getting in the way of creativity, but powerful enough to compete with any vector package out there" - Artboard user. • At your fingertips control - The familiar Mac interface makes you feel right at home. Style, Geometry, text and Layer tabs expose Artboard's powerful features. No more digging through menus to find edit commands. Keep your attention where it belongs - on your drawing. 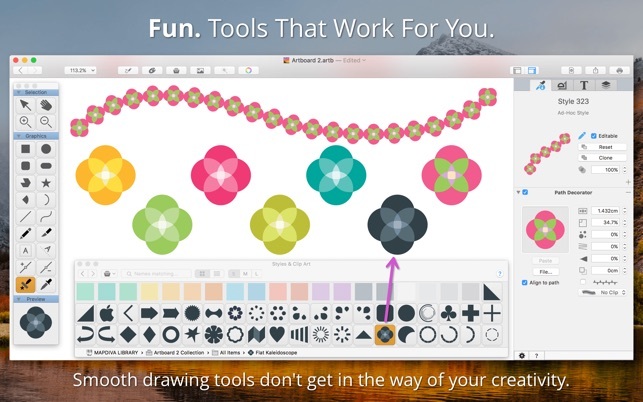 • Super smart drawing tools - The most advances smart objects let you modify shapes and paths with ease. "Live" adjust all vector paths, shapes and curves with a single direct context sensitive Select tool. 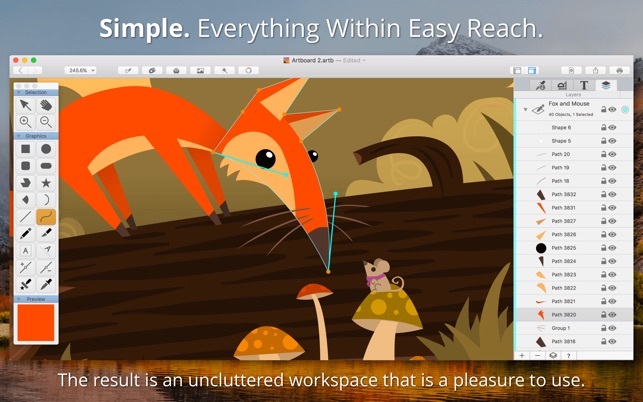 • More powerful styles editor - Go way beyond simple stroke and fill styles of basic illustration software. Artboard's Style tab is used to create and edit awesome expert "stacked" styles, including arrowed strokes, roughened strokes, pattern brushes, gradients, images, pattered and hatched fills, and more. • Editable clip art and styles - Artboard includes a built-in library of over 1,900 styles and clip art that are ready to use. Brilliant pattern brushes, color swatches, stylish shapes, maps, flags, flowcharts, floor plan and landscaping, and hundreds more. 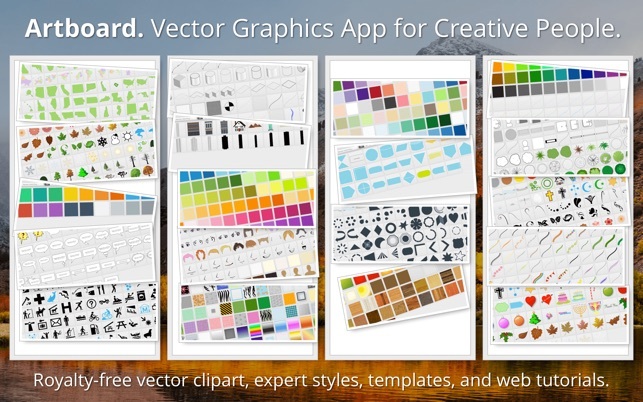 All fully editable vector graphics. Use them "as is" or take them apart and customise however you want. And of course you can build and share your own libraries. • Time-saving workflows - Advanced Print and Export options. Export to the web as PDF, PNG or PDF graphics from individual objects, layers, slices or your entire masterpiece! • Templates - Flexible templates help small businesses, students, hobbyist and 2D game designers get started on their projects quickly, such as making business cards, posters, pixel-perfect icons and graphics for social media. And of course you can create your own templates too. 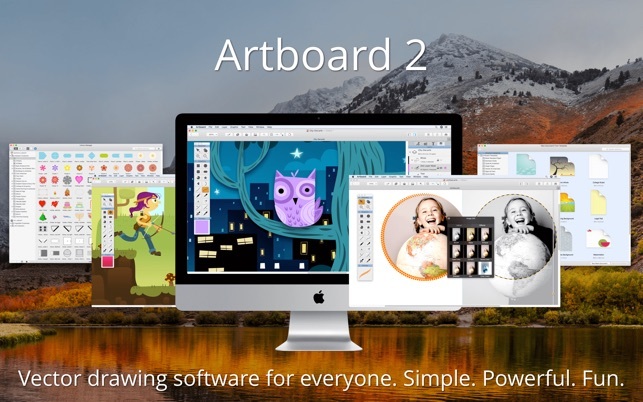 What else does Artboard provide that the other guys don't? A website loaded with support and training such as User Forums, clearly illustrated User Guide viewable right in the app itself, Free Trial, Sample Files and Design Tutorials. • Use metric or customary drawing units: mm, cm, inches, points. IMPORT All image formats such as TIFF, PDF, PNG, GIF, JPEG etc can be imported as images. Artboard can open its own ARTB vector files and SVG files for editing. EXPORT All image formats, plus export to vector PDF and its own ARTB vector file. Complete release notes for each version on our website. • Bugfix for better compatibility with macOS High Sierra and earlier. ©2019 Mapdiva Pty Ltd. All rights reserved.